It is said that first the French invasion at the beginning of the nineteenth century, and then the echoes of the Carlist Wars left such a deep impression on the lands of the Ulla that its inhabitants ended up integrating the showy military uniforms of the time into the only party that, at that time, the poor could afford: Carnival. Probably that war past is at the origin of the Xenerais da Ulla, the most characteristic characters of the Carnival in the municipalities of the lower basin of the third most important river in Galicia. The xenerais (generals) parade in the days of Carnival through the parishes of the A Coruña municipalities of Boqueixón, Santiago de Compostela, Teo, Touro and Vedra, and the Pontevedra municipalities of Vila de Cruces, A Estrada and Silleda, all of them in the shadow of the imposing Pico Sacro mountain. They wear a spectacular suit in which a very tall cap stands out, decorated with coloured feathers and, in the best designs, peacock feathers. The jacket is dark and is usually covered in chevrons, medals and gold epaulettes, and cinched to the body with a red sash and a flag. 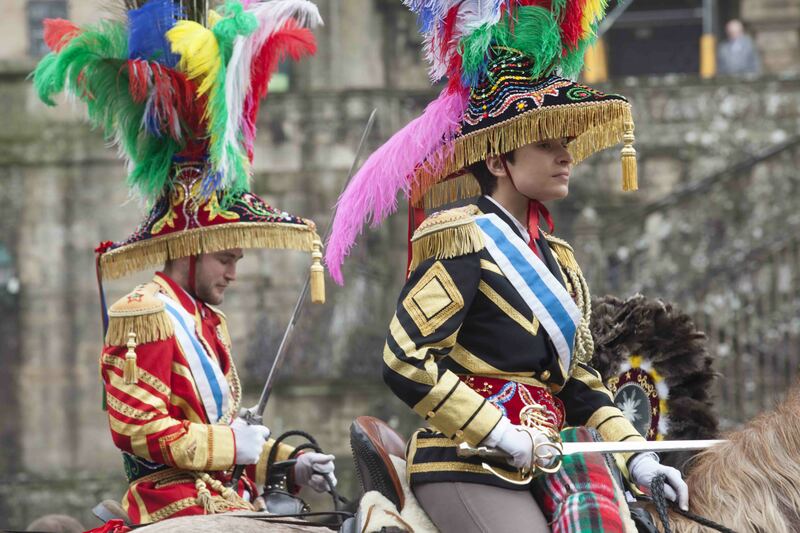 These costumes are very valuable, and it is not unusual to see the xenerais traveling from parish to parish with a simpler hat, to preserve the integrity of the main one. The Xenerais da Ulla ride on mounts as well groomed as they are. The horses, exceptionally cared for, are also adorned with feathers and special harnesses. In many of them, a mirror piece fixed on the head stands out. Along with the xenerais travel from village to village the so called correos (couriers), usually young people dressed in a somewhat more modest manner, with a circular cap and bells hanging from both the suit and the horse’s harness. These figures are responsible for announcing the arrival of the xenerais at the parishes and to assist the main characters. Also in the entourage is a person who carries a wooden box in which the neighbours introduce money. Why? The contributions are made so that the xenerais, when arriving at the door of a house, will stop to say the vivas (cheers) that is, to pronounce, sword raised, words of praise for the donor and their family. The cheers are usually a prelude to the combats in which the xenerais measure their prowess: the “atranques”. These are purely dialectic fights, in which two xenerais face off with ingenious rhymes aimed at making fun of the opponent, waving the sword with ease and sitting very stiffly on the chair. In them it is not uncommon to discuss the neighbourhood and political issues that marked the past year. For many years now there have been xenerais of both sexes, and all of them show a great verbal skill in this type of horseback spat..
Carnival traditions are very abundant in the region of the Ulla, and these main characters are accompanied, varying from one municipality to the next, by other traditional characters, such as the king and queen (dressed similarly to the xenerais and the correos, but travelling on foot), the Demon (particular and unique, since it is only found in the village of Reis in Teo), the choirs or the troupes mounted on peculiar artisan carriages.